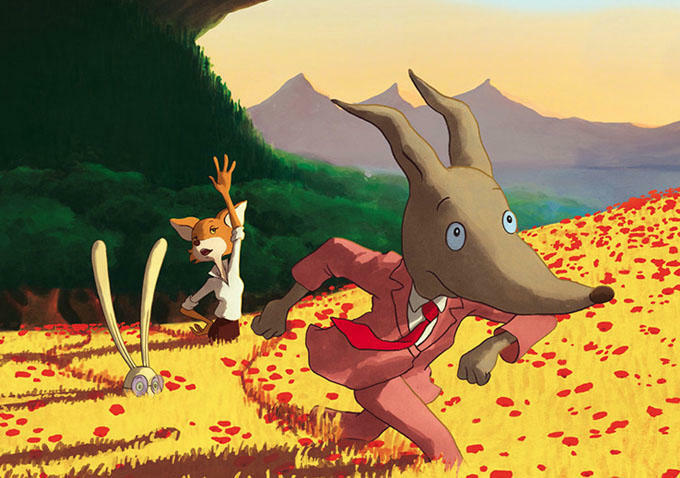 In the came-from-out-of-nowhere division: Animation Scoop has a review of a new DVD release, Wolfy, The Incredible Secret from France. Random Media (in partnership with Cinedigm) have now released it with an English soundtrack. “A story of political machinations, anamorphic animal hierarchy and gypsy fantasy – traditionally hand-drawn with a look that leans far away from photorealism. The convoluted English title (French title: Loulou, l’incroyable secret) actually refers to quite a few secrets, which unravel as Wolfy, an easygoing wolf, and Tom, his neurotic bunny pal, travel to Wolfenberg to find Wolfy’s mother. A gypsy has told them that she is the true princess as well as the leader of a rebellion against an evil usurper—a manipulative wolf named Lou Andréa.” Take a look at the trailer linked to the article. It won’t make much more sense, but it’ll give you an overall idea of the movie’s look and feel. "Loulou, l'incroyable secret" won the César Award, "the French Oscar", for Best Animated Feature of 2013; supposedly for all movies shown in France during 2013, including all the American-made animation features shown in France which was probably all of them. Does the "Loulou/Wolfy" DVD include both the French audio with English subtitles and an English-dubbed track, or is it a kiddie cartoon DVD with only an English audio track?